Location can be the making or breaking of a tourist-based business. The benefits of being in a popular area are many, but you need to be able to set your business apart from the competition that is likely to be established in an area where there are many attractions. The question of location arises at different levels too. You need to think about the region first, then the town or village, then finally the location of your particular establishment itself. At each level you have to weigh up the benefits of being there and make sure they outweigh the disadvantages, as there will surely be some. At a regional level, you should decide whether you are going for a rural area or an urban area, and whether to go for the tourist spots or not. Seaside towns or inland national parks are the most obvious regions to pick for a B & B, such as Devon or the South Coast, or the Peak or Lake Districts. Here you can be sure of a certain level of trade and support from local government and tourist associations, but, of course, there will be a lot of competition, and the trade will be seasonal. Urban areas can offer a decent business too, although if you are not in a city with natural charms that attract tourists such as London, Edinburgh or Bath, then you will have to focus on business travellers or people visiting friends and family. The benefit of this is that your business is less likely to be affected by the seasons, although with no tourist attractions you will need to rely on your own marketing to attract customers. This is likely to involve local advertising and marketing so that people and organisations in your area will think of you first when someone visits them. 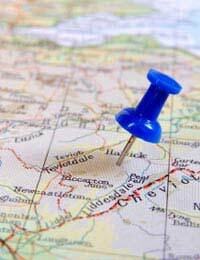 Once you've determined the region that you are going to go for it's time to look at a specific village, town or suburb. If it's a tourist area you need to pick somewhere that's central to all the attractions and to other services that people might want. For example, a lot of active retired people take holidays and breaks outside the school holidays, when it's quiet, and they often use public transport. This might direct you toward somewhere that has a railway station and bus service rather than a town that has neither. Next it comes down to the immediate locality. Unless you want to be offering a choice of evening meals, which tends to make you more a hotel than a B & B, you should pick somewhere that has a choice of eating and drinking facilities within easy walking distance. Being located nearby the tourist attractions is crucial too. In a seaside town many people will look one or two streets away from the seafront to get a place that's cheaper and quieter than the main promenade. But they won’t look much further than that, although having a prominent site on the main road into the town can work well. Finally, beware buying the perfect property if it's difficult to find. Particularly if you're in a tourist location with lots of competition, if people can't find you, they'll simply stop somewhere else instead. Hi, I'm thinking of starting my own bed and breakfast business, Where do I start?